James & Jerome (James Harrison Monaco and Jerome Ellis) are a duo of musician-storytellers based in New York. 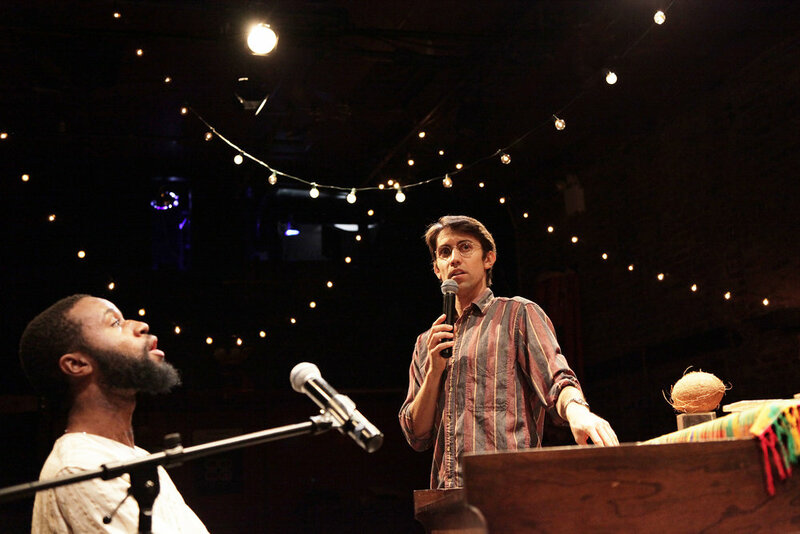 They make hyper-literary, live-music story performances for theaters and other spaces. Their work has been presented by The Metropolitan Museum of Art, Lincoln Center Education, La MaMa, the Under The Radar Festival, Joe's Pub at The Public Theater, Ars Nova, and The Kimmel Center for the Performing Arts, among others. They often collaborate with directors Rachel Chavkin, Andrew Scoville, and Annie Tippe. Recent James & Jerome projects include: Piano Tales (La MaMa, Joe’s Pub at The Public Theater, Lincoln Center Education, etc. ), Ink (Metropolitan Museum of Art, The Brick, BRIC Arts Media), Aaron/Marie (Under The Radar Festival, Ars Nova), and They Ran and Ran and Ran (HERE Arts). They have developed their work at residences with The Kimmel Center for the Performing Arts, The Public Theater, Berkeley Repertory Theatre, and BRIC Arts Media, and they were members of the Public Theater's inaugural Devised Theater Working Group.